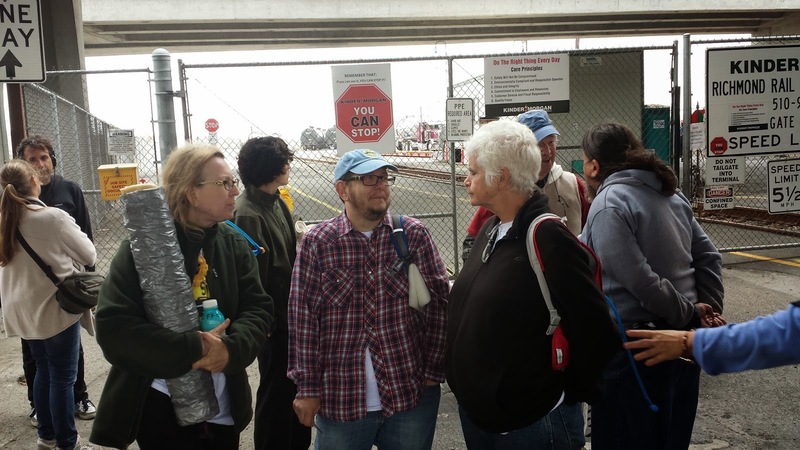 Early in the morning on Thursday, September 4th, 2014, eight people locked down to the gates of a crude-by-rail facility owned by Kinder Morgan in Richmond and prevented trucks from coming or going for three hours. Later that afternoon, two of the organizers (one of whom was me) were interviewed on Andrés Soto’s half-hour show on KPFA, in which we talked about the action, the dangers of crude-by-rail, and the context of the larger climate movement. The transcript is below. Blockade the Bomb Trains! 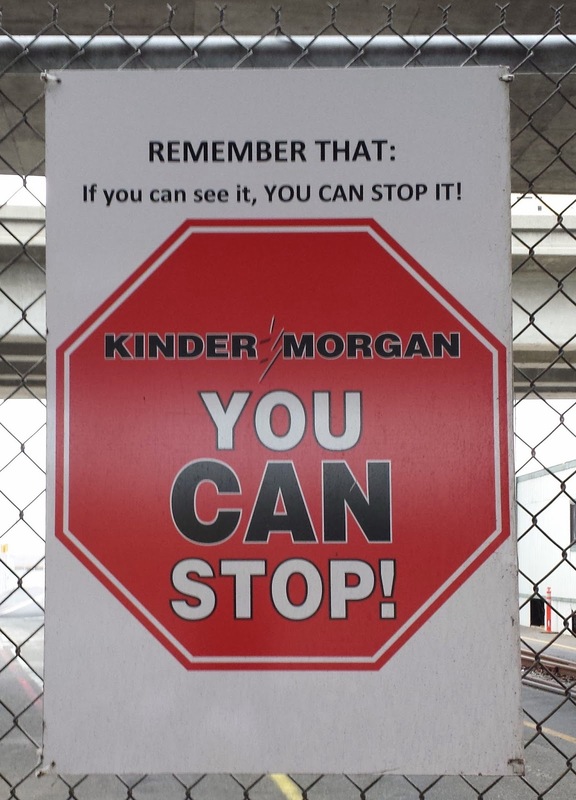 Lockdown at Kinder Morgan 4 Sept 2014 from Peter Menchini on Vimeo. Here’s the full audio – about half an hour. Andrés: This is El Show de Andrés Soto, formerly of the Morning Mix. Crude-by-rail. 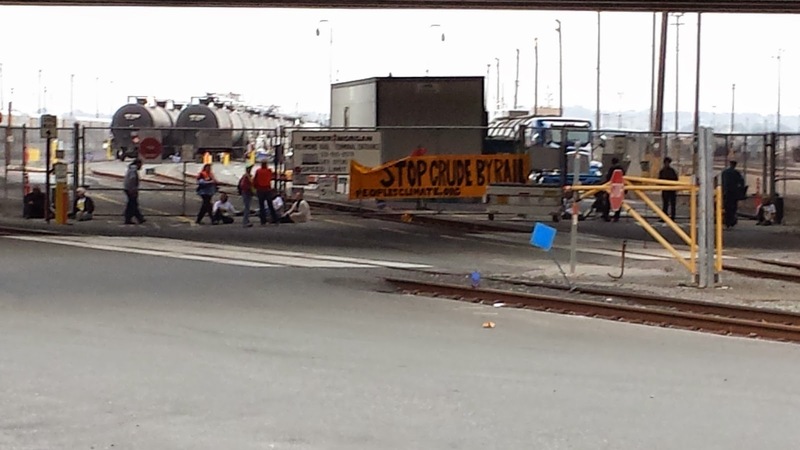 The Bay Area’s been targeted for dangerous Bakken crude deliveries to refineries throughout the Bay Area. 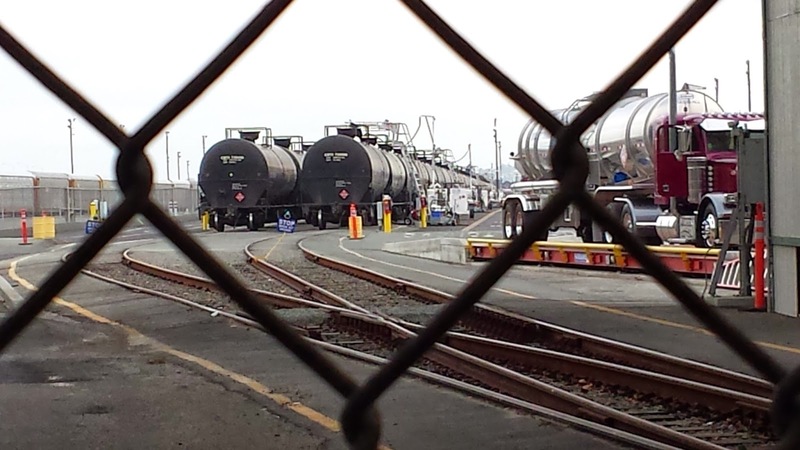 There was an important action yesterday in Everett, Washington, to halt crude-by-rail and one this morning in Richmond. There’s also a critical court hearing in San Francisco tomorrow to stop the Kinder Morgan crude-by-rail operation in Richmond. We will speak with the key organizers of the action in Richmond today and talk about all of the events and activities, today on El Show de Andrés Soto on KPFA 94.1 FM, sometimes the people’s radio station. All of this and some very cool music. Andrés: Yeah, that’s the sounds of Chester “CT” Thompson, formerly of Tower Power, and his signature song “Squib Cakes” from his new album Mixology. And featured on that includes Howard Wiley, straight out of Richmond, on tenor saxophone, and Ron E. Beck, who used to play with Tower himself. So I’m very pleased to have here in the studio once again Ethan Buckner from ForestEthics. Welcome, Ethan! Ethan: Thanks, Andrés, thanks so much for having me. Andrés: And by phone we have Martin MacKerel, Martin, what’s happening, man? Martin: Oh, good, good to be on the phone here with you! Andrés: Right on, right on. So, you know, I mentioned in the lead-in about the action here in Richmond and I first heard the concept from you two guys. And so, Martin, why don’t you tell us what was in your mind when you first started thinking about crude-by-rail in Richmond and why we needed to have some type of action there to bring attention to it. Martin: Well, to bring it back a little bit I’d actually spent some time helping the folks in Pittsburg, California, fight the proposed WesPac oil terminal there, and it seemed like a big part of what they were doing was that what they wanted to do was to bring in oil by rail and that’s where I, people in Pittsburg, and a lot of other people working in the kind of climate justice and environmental movement in the Bay Area sort of really became aware of the dangers of crude-by-rail; that this Bakken shale oil, for example, is very explosive, and that it killed 47 people in Lac Mégantic last summer. And so we had succeeded in sort of fighting off, at least indefinitely delaying, that project, and then lo and behold we find out through KPIX, which you know – they discovered that Kinder Morgan had been bringing in these same what we call “bomb trains”, these trains full of explosive oil into Richmond, and in fact passing through many of these communities, undoubtedly Pittsburg as well. So from that, once that was found out, these four organizations got together and filed a lawsuit against Kinder Morgan and against the Air District for giving them a permit without any environmental review, without any public input or notification. Andrés: That’s the Bay Area Air Quality Management District, the people that’re supposed to be responsible for protecting us by cleaning up the air. Martin: Exactly. So there are air pollution issues and there’s other issues as well, and it deserves a full environmental review and a full understanding of what the dangers are. And so, I felt that it would be good to bring attention to this court case, you know, court cases are often quite dry affairs, but we really wanted to bring this out into the open, make it a colorful action, and bring attention to this stuff that is coming in on a regular basis, that this explosive and dangerous material is being handled and we a) need to know about it and we need to have a say in whether it’s being brought in, and we think absolutely it should not be brought in. Andrés: Well, thank you. And then Ethan Buckner with ForestEthics. ForestEthics has been concerned about extreme extraction in Canada as well as the Bakken crude up in North Dakota. Tell us about how ForestEthics got involved here in the Bay Area and this focus on the crude-by-rail and especially this project in Richmond. Ethan: So ForestEthics has been fighting tar sands pipelines up in British Columbia for a number of years, and it came to our attention that increasingly we would not be able to stop the expansion of tar sands development if we did not also look at the ways in which US refineries were expanding and reshaping their operations to bring in tar sands from Canada. At first, our bigger concern was oil tankers from British Columbia coming down through the San Francisco Bay, but as we started to look at that issue, and as a lot of the pipeline victories kept coming through – delays in Keystone XL, delays in the Enbridge and Kinder Morgan pipeline projects up in British Columbia – that the industry has rapidly shifted to moving crude on trains, both tar sands and increasingly, as mentioned, the Bakken oil from North Dakota, both types of extreme crude that pose similar but unique risks to public health and safety and similar risks to the climate in terms of enabling continued exploitation and oil expansion in North America. And so, as we started paying attention to oil by rail, we realized that on the West Coast, in Washington and Oregon and here in California, is one of the “hot spots” for oil industry expansion when it comes to rail, and that’s where we need to focus our resistance. Over the past year and a half, we’ve seen incredible movement building, both within and between communities that are impacted by this issue, that see the images of all of these disasters and come into the issue from a kind of perspective of I need to protect our health and safety, these trains are dangerous, they pose an existential threat to my community’s life – and then from there kinda been connecting with other communities that are facing similar issues and tying it back into the bigger issue of climate change and needing to move our energy infrastructure away from building new oil infrastructure towards clean energy, and seeing that systemic problem, that chokehold that the oil industry has over our communities, over our economy, and over our public agencies when you see an agency like the Bay Area Air Quality Management District that is supposed to be protecting public health that many times appear to be protecting corporate interests and protecting oil interests before actually serving our communities in the way that they are designed and mandated to do. Andrés: Well, you know Martin, you mentioned WesPac out in Pittsburg, where they don’t have a refinery, but it was going to be a massive rail yard and they were going to revitalize, so to speak, some old oil storage tanks that were used formerly for a PG&E power plant, and because of the organizing out there, because of the public outcry, it seems that that project has been pushed back at least somewhat indefinitely right now, and then we saw similarly over in Rodeo with the Phillips 66 project, that the Planning Commission of Contra Costa County unanimously voted in favor of it, but it was stacked with building trades, industry guys, realtors, and then we saw in Benicia, where they were trying to push it through without any CEQA review, just a simple mitigated negative declaration, but now it’s in this entire review process, so it seems like there’s been some successful pushback here. Martin: Yeah, I’d say absolutely, we – you know, it’s kind of a pitched battle, and it feels like in some ways we’re holding our ground. But you know, the issue is, from a climate perspective we need to do better than just stop new infrastructure development. There’s new infrastructure going on all over the place, of course, but that is increasingly being fought. People all over the country and even the world, but especially in the US you see people fighting coal export terminals, you see people fighting mountaintop removal, you see people fighting fracking, etc. etc. Andrés: Why don’t you tell us about the action yesterday up in Everett, Washington? Martin: Oh yeah, so this is similar to ours. So the Pacific Northwest has been a hotbed of opposition to all kinds of fossil fuel infrastructure. Coal export terminals, oil, crude-by-rail, …. 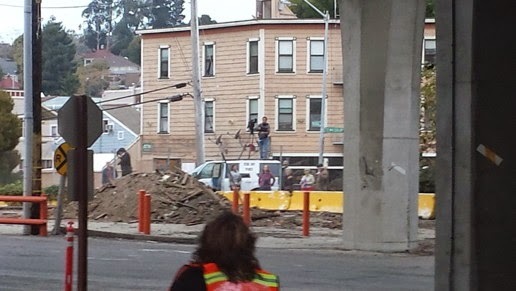 So in Everett, Washington, there was a blockade where they set up a tripod – a structure that someone was sitting on just directly above a rail line, and they stopped the rail lines for I think 8 hours, to stop the oil trains from going through to the refineries up there in the northwest corner of the US. And it’s a similar situation, it was also the same railroad that the Kinder Morgan property happens to be on, which is BNSF, which has quite a bit of their business in these oil trains. Andrés: Well, you know, we were talking earlier where they’re really trying to play it like their hands are tied, that they, as a common carrier, they have to deliver this stuff, but your research has shown something a little different. Martin: Oh yeah, so you know a spokesperson was quoted in the AP article on the Everett direct action, “Hey, you know, we’re common carriers; we can’t discriminate, you know.” Well, that’s true, but when you look at their marketing materials, they are actively promoting crude-by-rail, they are reaching out to the oil producers and other groups and saying, “Hey, why don’t you transport it by rail, it’s great for all these reasons.” They have maps where they show crude-by-rail terminals, proposed and existing, and just – you know, this is a business they are trying to win and trying to grow. 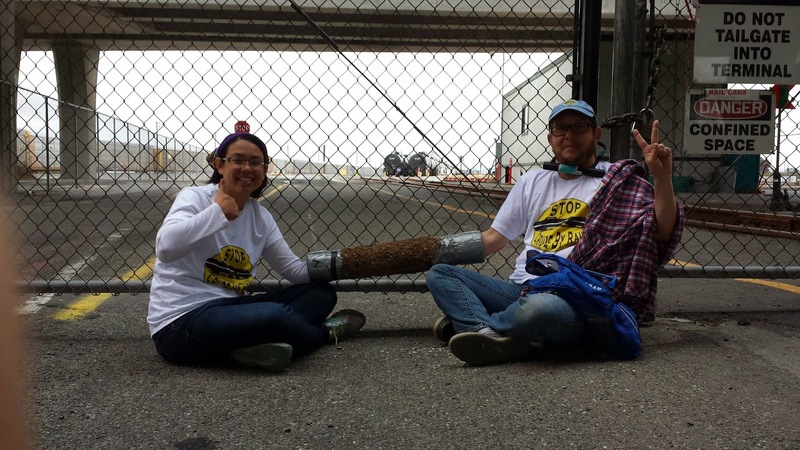 Andrés: Alright, well, we’ve been talking with Martin MacKerel and Ethan Buckner who helped organize an action today down in the Kinder Morgan yard at the BNSF railroad yard in Richmond. But we’re going to take another little music break, and this one is by Berkeley’s own David Murray, from his album Be My Monster Love and this one is called “French Kiss for Valerie”. Andrés: Yeah, the inimitable sounds of David Murray on tenor saxophone, along with Marc Cary on piano, Nasheet Waits on drums, and Jaribu Shahid on bass. And I’m joined in the studio once again by Ethan Buckner of ForestEthics and Martin MacKerel by the phone, and let’s talk about the action in Richmond today. So, Ethan, kind of give us a blow-by-blow of what happened and why this thing was so successful. Ethan: Absolutely. So, we entered the Kinder Morgan rail yard, which is a leased section of the BNSF rail yard in Point Richmond, just across the street from the Chevron refinery, and folks used a combination of tools, including U-locks and lockboxes, which are kind of sections of fabricated steel and/or PVC piping that people clip themselves into, to secure themselves to the gate where trucks will pull in and offload the load of Bakken oil from these trains that roll in 3 to 4 times a month, and bring that oil to Bay Area refineries. Typically, one oil train is over a mile long, over 100 cars, and with each car it takes about three trucks to fully offload one car. So you’re looking at about 300 truckloads per train driving on Bay Area highways and adding additional pollution. Andrés: And they’re taking this stuff up to the Tesoro refinery in Martinez. Andrés: Over our city streets and highways. Ethan: Exactly, and possibly others as well. So these folks have been working together – we’ve been working together for a while now, and building trust, and training, learning various skills and … really focusing our efforts on efficient and effective deployment of the action, and being really focused on the message, and maintaining a real peaceful and nonviolent demeanor, had very, very good relations with both the workers and the police there – you know, we are here because we really see this operation as illegal; you know, we may be trespassing, but what we’re really pointing out here is that that facility shouldn’t be operating at all. Had a very good response from folk who were on-site; it was not an antagonistic event at all, really, and we were able to successfully shut down operations for about 3 hours, and had a very successful action. Andrés: So, Martin, you know, this rail yard, as Ethan mentioned, is right across the street from the Chevron Richmond refinery, but it’s also very near to Point Richmond, Washington Elementary School, Atchinson Village, St Johns Apartments, Peres Elementary School. What is the risk to these communities if there was a catastrophic event at this rail yard? Martin: Oh, I mean, it would be terrible. Right in the area, within a quarter-mile or so, there’s a lot of little cafés and restaurants, it’s a very nice area. If you look at the pictures from Lac-Mégantic, that area was just devastated by the crude oil, the Bakken shale coming out of these railcars and lighting on fire – it would go into the sewers and flow burning through the sewers and light buildings on fire that way, I mean just absolutely apocalyptic images from that event, and it’s unfortunately not unthinkable that something like that could happen to Point Richmond, and it’s absolutely – it’s not at all out of bounds that hundreds of people might die in an incident like that. Now – what’s probably more likely than something happening right there in Point Richmond is something happening on the way. So that affects Richmond, Martinez, Pittsburg, and if you go up-rail, all the way up to, say, Sacramento and Davis, and then through the states all the way to North Dakota where it comes from. Everywhere where it goes through, you’re looking at a danger zone of – I’m not sure of the figures, I think Ethan might know – but even if you just look at let’s say half a mile on either side of the train tracks, that’s an enormous amount of land, and there’s an enormous number of people who live there, because often these train tracks and these trains go through very densely populated areas. Some of these train tracks, different branches of these tracks, they keep going, they go right through Berkeley, through Oakland – right through Jack London Square – so when we’re fighting crude-by-rail, we’re fighting not just this Richmond facility, but these other facilities that they may be trying to build or thinking about building, and we’re looking at, literally, just in the Bay Area, the hundreds of thousands of people whose lives at risk. Andrés: Well, let’s shift over to the court action tomorrow. There’s going to be a hearing at the San Francisco Superior Court at 400 McAllister Street in Dept 301, I believe, and that’s happening 130pm, and it’s right across the street from San Francisco City Hall. And as we mentioned before, Earthjustice is going to be representing Communities for a Better Environment, Asian-Pacific Environmental Network, Sierra Club, and Natural Resources Defense Council, seeking injunctive relief, in effect trying to get the judge to stop this process and say, “Wait a minute, this permit was issued illegally by the Air District, Bay Area Air Quality Management District, and we need to go back to the drawing board and develop an Environmental Impact Report about that, but it looks like the industry is pushing back, they filed their own motions for summary judgment, basically trying to throw it out of court, and so, what is the significance, Ethan Buckner, of this kind of court case challenging this kind of operation under CEQA? Ethan: It’s a big deal for a lot of communities in California, because there are other projects as well: up in Sacramento, the McClennan rail yard, over in Stockton you’ve got the new proposed Targa rail terminal there, and so other communities are going to be looking at this decision as a precedent on whether or not they can have some agency in the process where companies will transition a rail yard from carrying one form of hazardous material over to Bakken crude and making the case that there is no added impact, but we know that that’s not true because of the nature of this particular oil. Andrés: So if people wanna join, they can show up tomorrow at 12 noon at the courthouse, once again at 400 McAllister Street in San Francisco down at the Civic Center and join in the courtroom, and actually observe the process and listen to the arguments, and see what the judge’s determination will be, although it’s unclear if he’ll make a decision tomorrow. And, so Martin, you know, looking at the potential impact of this decision, and the impact for other communities, how do all these events tie in into the bigger picture of trying to send the message “stop extreme extraction” and “let’s protect the climate now”? Martin: Well, honestly, I think that can be a little difficult. I think that’s a big part of what we’re trying to do is do that tying together. People in these refinery communities and other areas have historically been fighting just their fight in their community, and I think a big part of what the Sunflower Alliance in particular has done has helped to connect the people in these communities with one another, to see the parallels in, say, the fight in Benicia to the fight in Rodeo and Crockett, and you can see this – the Bay Area Refinery Corridor Coalition is a group of these groups from the different refinery areas who are coming together to speak as one voice and to share their stories and share their lessons, so I think it’s an ongoing project to build this up into a regional and a bigger and bigger organization and movement. Andrés: Well, there’s also activity down near Santa Maria, where the other half of the Phillips 66 plant is at, right? Andrés: Not to mention all the other species. Andrés: We need to stop crude-by-rail now! Martin: We gotta stop crude-by-rail now, we’ve gotta stop all of the fossil fuel stuff and convert to clean energy. Andrés: Yeah. Well, Martin MacKerel and Ethan Buckner, thank you so much for being on the program today, El Show de Andrés Soto, and if you want to join all of us tomorrow, show up at 12 noon at the San Francisco Superior Courthouse, 400 McAllister Street, Civic Center, and join us in the courthouse to watch this legal drama go down. We also have an announcement that coming up on September the 11th, down at the Fremont Senior Center, at 40086 Paseo Padre Parkway in Fremont, there will be a community forum from 7 to 9pm and the title is “Exploding Oil Trains in Fremont?”. And this is being co-presented by Sierra Club, Sunflower Alliance. That same night, if you’re not down in Fremont, come up to the Benicia Planning Commission, Benicia City Hall, where the Planning Commission will be making their comments on the proposed EIR for Valero’s dangerous crude-by-rail project. I’d like to sign off and say thank you all, thank you to Eric at the board, Anthony over there helping out, the line production. This is KPFA 94.1, KPFB in Berkeley, and KFCF in Fresno, and we’ll check you all out later. KPIX story, Sacramento Bee, the SF Bay Guardian, and, strangely, Chevron’s PR newspaper, the Richmond Standard. One set of photos from Brooke Anderson, and another set from Matthew Gerring. Next Post A Virgin Galactic rocket exploded. Good.